The free-to-play MMO shooter is entering the second phase of its beta. Mark Kern left Blizzard to form Red 5 Studios and create the game he had in his mind, a free-to-play shooter with all the production quality Western MMO fans expect from a big subscription service like WoW or more recently The Old Republic. 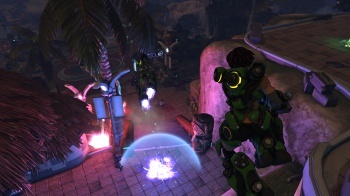 Firefall entered the beta phase late in 2011, and Red 5 has slowly been adding players in waves, including all those who tried out the game at PAX East 2012. Today, they've announced that the total number of registered users now surpasses 500,000 and the plan is to open up more content to more subscribers in the next few months, as well as continue to iterate and improve the game with some pretty radical changes. "The feedback and support from our community has been an integral part of the development process," said Kern about how the design of Firefall has progressed. "We're treating Firefall as a service, which means it's critical that we're continually adding value and fun for players. Having a large and growing community lets us know that we're on the right track. But more importantly, their feedback helps us stay on the right track." One of the big changes in store for the beta-testers is the abolishment of leveling. That's right, all progression in Firefall will be chosen by the player organically. You'll still gain XP from kills and completing tasks, but you can spend that XP directly on upgrading the battleframe you like to play with the most. For those of who who just thought, "What the heck is a battleframe? ", check out my preview of the Firefall beta here. Red 5 also released the system specs needed to run the game. These are pretty beefy, and I can tell you that it will be necessary to have a souped up modern PC in order for the gorgeous graphics of the game to come to life.